I loved the look of SeeMore's new DB4x mallet putter. When I first saw the pictures posted on the GolfWRX forum I like the combination mallet/plumbers neck. Now comes the official release from SeeMore. The DB4x and the rest of the CS Gunmetal series are available January 2011 and retail for $295. The SeeMore Putter Company for 2011 expands its highly successful CS gunmetal series by introducing the DB4x mallet. “With the introduction of the DB4x, the beautiful milled 2011 flagship CS Gunmetal series is perfectly rounded out to include 2 of our classic SeeMore RST designs (mFGP and mFGP2), and 2 new hosel designs (DB4 and DB4x). SeeMore now offers our proprietary and proven precision alignment system in a range of putters that meets every golfers eye,” stated Jim Grundberg, SeeMore’s co-owner along with Jason Pouliot. The DB4x is 100% precision milled carbon steel with a proprietary multi-layer black gunmetal finish for striking and lasting beauty. 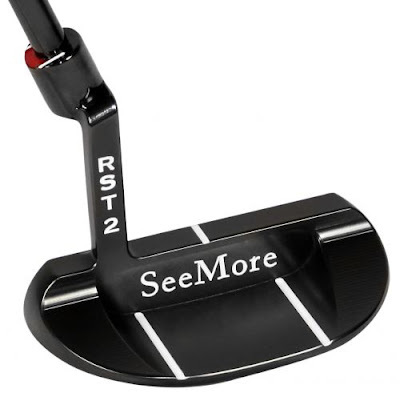 The new DB4x is milled in the USA and features SeeMore’s new RifleScope 2 (RST2) technology, which offers the key benefits of SeeMore’s original RifleScope Technology (RST) in a hosel style putter. The RST2 alignment system is housed on the top of the hosel vs. the original RST system, which is found on the top heel section of the putter. The 2 white lines on top of the hosel are milled perfectly parallel to the face of the putter, creating a perfect "gun sight" effect where the golfer is assured of being square to the intended target line when the white lines are visible and the signature red dot is hidden. SeeMore putters essentially offer a 4-way reference point for the golfer to know they are ready to make a perfect stroke. This is such a very interesting topic and I learn very something new about this topic.